Richard Bray, our new development director, pictured on Azalea Way. 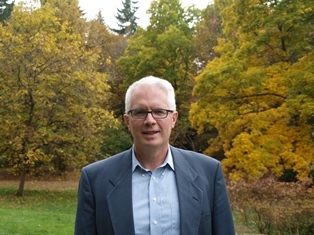 The Arboretum Foundation is pleased to announce the hiring of Richard Bray as its new Director of Development. Richard is a highly experienced philanthropy professional with strong ties to the regional business, media, and non-profit community. He will take the helm of the Foundation’s capital campaign and operations fundraising, both of which are essential to the preservation and enhancement of Washington Park Arboretum. Richard’s most recent position has been as the director of donor and community relations for the Society of St. Vincent de Paul of Seattle/King County, where he worked for four years. Prior to this, he served as the director of planned giving for Catholic Community Services of Western Washington, Seattle, for seven years. In addition, he has consulted for a number of non profits in the area of fundraising and communications. A proud resident of Renton, Washington, with a passion for community volunteering, Richard is looking forward to his new mission. “We are excited to have Richard join the Arboretum Foundation and bring his expertise in fundraising, marketing, and planned giving—and his passion for making a difference,” says Paige Miller, Executive Director of the Arboretum Foundation. Richard will spearhead the Foundation’s new campaign, launched in summer 2012, to raise $5.5 million over the next two years. Of this total, $1million will be used for general endowment and become the backbone of the Foundation’s continued funding of day-to-day programs in the Arboretum such as the Arborist and Tree Care Program and Youth Education. The remainder will be used to complete the construction of two new eco-geographic immersion forests in the Arboretum’s exciting Pacific Connections Garden: a two-acre New Zealand Forest and a two-acre Cascadia forest. When fully grown, these displays will allow visitors to experience what it’s like to walk through a native forest in New Zealand or the Pacific Northwest without having to leave the city of Seattle. About $2.8 million will be used to create a maintenance endowment, ensuring the care of these new forests for generations to come. If you have any questions about the campaign or about donating to the Arboretum, please contact Richard by phone at 206-577-0549 or via email at rbray@arboretumfoundation.org. Richard is a member of both the Seattle Philantrophic Advisors Network and the Washington Planned Giving Council. He can help donors with their charitable giving, from straightforward contributions to sophisticated charitable options for immediate gifting or as part of estate planning.